Psychological manipulation by marketers may be causing you to overspend when you shop. It’s time to get wise to retailers’ tactics so you’ll know how to protect yourself and money. As a Dollar Stretcher reader, you probably know how distractions can help the retailers to slip their hands in your pocket without you even realizing. But what you perhaps didn’t know is retailers deliberately utilize some sneaky techniques to create such distractions. These are much more subtle than any noise or attention grabbing posters and created using the knowledge of a field of psychology, known as cognitive biases. The human brain has three parts: primal, emotional and logical. The logical part is considerably newer and yet to be evolved fully. Cognitive biases are simply loopholes of that logical brain that make people deviate from making good logical judgments. In simpler words, cognitive biases force you to buy a $2000 watch even when you are short on money. Applications of cognitive biases are known to the marketers and they utilize those with great efficiency. Here are the three most used biases. 1. Seductive Power of "Free"
"Free" has a tremendous effect on the human mind. Consider which one you would prefer to have (try it quickly)? $25 gift coupon for $7. If you are like most people, the $10 gift coupon will be your choice, though the second option is more profitable. Why is that? Because humans are programmed to relate the word "free" with potential gain and zero risk. But these free things come with the emotional burden of reciprocation. When you are taking free stuff, your emotional brain is getting ready to put pressure on you to buy from the same seller to get rid of that burden of favor. Related: Are Your Emotions Making You Poor? Another downside of "free" is people often get so charmed by the word that they completely miss the hidden cost. For example, look at this advertisement below. 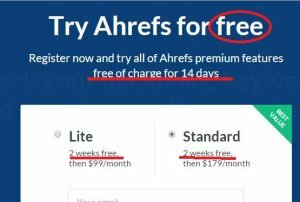 If you are too focused on the word "free" and sign up without reading the details, you will end up spending $99/month after 14 days. If you need their services, then it’s fine. Otherwise, you should read it properly. Such examples are plentiful, even for mundane things like food, clothes, etc. To avoid the "free" trap, you should read the terms and conditions thoroughly, especially about the involvement of any post purchase charges. Have you ever seen an advertisement promising you a $500 product for $150 because it is Valentine’s Day, Black Friday, etc.? I bet the answer is yes. Well, this is a marketing trick that exploits another bias called the "Anchoring Effect." The human mind requires some standard or number to measure profitability. Whenever the advertiser tells you about the sale, he/she passively sets the standard in your mind and makes you focus on the "price drop" instead of the actual worth of the product. 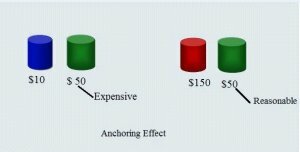 The “Anchoring Effect” and the “Scarcity Principle” come hand in hand. Those limited period offers or Black Friday sales are designed to create a sense of urgency in your mind and force you to buy based on emotion. To avoid this, you should ask yourself what the actual price should be instead of how much discount you are getting. Take your time before making any decision, and if someone is aggressively pressing you to make a buying decision, the deal is probably not best for you. The “Band Wagon Effect” is a cognitive bias that makes people stick to a decision that was already made by a large number of people with similar backgrounds. This effect is perhaps the most widely utilized bias in marketing. The entire concept of "brand" is based on this bias. With a lot of money in their pocket, businesses launch powerful marketing campaigns to gain powerful social proof. Afterwards, making customers choose branded, overpriced products over the cheaper local alternatives becomes a downhill battle. Generally fast food chains, fashion houses, etc. use the Band Wagon Effect and the Anchoring Effect to set a trend by creating a sense of popularity. Buyers usually fall into this trap and end up buying a lot of stuff they don’t need or enjoy. Whenever any retailer or business tries to pull the "popular" card to convince you to buy their product, you should consider whether you would really want to buy the product if it were not "popular." Trust your instincts. If the answer is yes, then go ahead. Otherwise, think twice before reaching for your credit card. Have you overspent your way into debt? Make a plan to get back out. 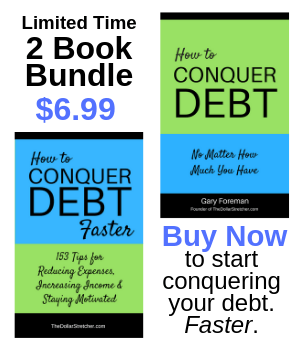 Get How to Conquer Your Debt No Matter How Much You Have and create a debt payoff plan personalized to your budget and lifestyle. Here is a tip to protect yourself from wasting money on trendy, yet poor looking clothes. I call it the rule of three. Whenever you see a piece of clothing, try to imagine how many jaw-dropping combinations can be created with other items of your existing wardrobe. If the number is less than three, don’t purchase it. You can never totally avoid such psychological manipulations, but with enough knowledge, most of the time, you can stop yourself from spending on things that someone else wants you to buy.